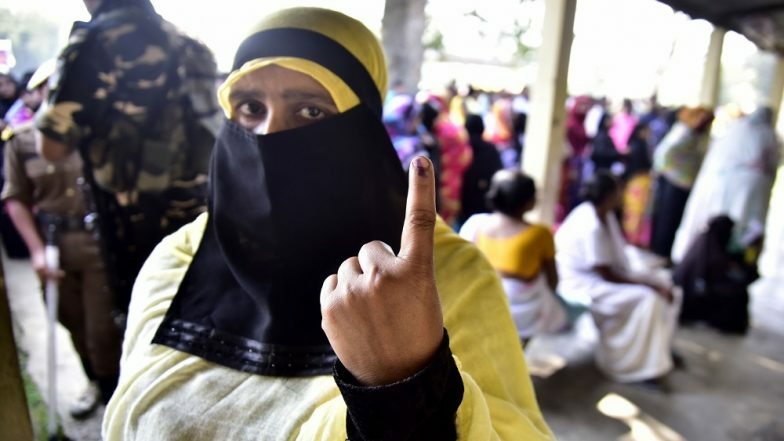 Guwahati, April 11: Five Lok Sabha constituencies in Assam that polled on Thursday saw a high voter turnout despite growing protests against the BJP-led government's move to pass the controversial Citizenship (Amendment) Bill 2016. The five constituencies that went to polls on Thursday -- Tezpur, Kaliabar, Jorhat, Dibrugarh and Lakhimpur -- are also known as the tea belt of Assam since majority of the tea gardens in the state fall under these five constituencies. Overall voting percentage in these constituencies stood at about 59.46 per cent at 3.00 p.m, with Tezpur witnessing over 63 per cent polling, Kaliabar 60 per cent, Jorhat 62 per cent, Dibrugarh 59.29 per cent and Lakhimpur recording 53 per cent voting. In 2014 parliamentary elections, the Bharatiya Janata Party (BJP) had won Jorhat, Dibrugarh, Lakhimpur and Tezpur seats, while Kaliabar seat had gone to the Congress. Assam BJP President Ranjit Kumar Dass expressed happiness over the high voter turnout and said that the large number of voters coming out to vote has ensured that the saffron party will win all the five seats. Andaman and Nicobar Lok Sabha Elections 2019: Phase I Voting Ends for Andaman and Nicobar Parliamentary Constituency, 61% Voter Turnout Recorded. "I thank the people of these constituencies for their support. The people's response has made it clear that the mandate in these five constituencies will be in our favour," Dass told IANS. However, the general secretary of the Assam Chah Mazdoor Sangh, Rupesh Gowala, had earlier said that the tea tribe voters would consider several issues before casting their votes this time.